Macy's Thanksgiving Parade Balloon Inflation | When, Where to Watch. Macy's Thanksgiving Day Parade has been a Holiday tradition for decades. It takes a whole village to organize this kind of event. Visitors who want a preview of the parade balloons won't want to miss the opportunity to see the balloons grow at the Macy's Parade Balloon Inflation live event. This takes place on the eve of Thanksgiving on the Upper West Side. The balloons are inflated at the American Museum of Natural History and there is a designated viewing path for observers to see firsthand. When is the Macy's Parade Balloon Inflation? The balloon inflation takes place the afternoon/evening before Thanksgiving Day. For 2014, the balloon inflation will be Wednesday, November 26 from 3-10 p.m.
Where is the Macy's Parade Balloon Inflation? 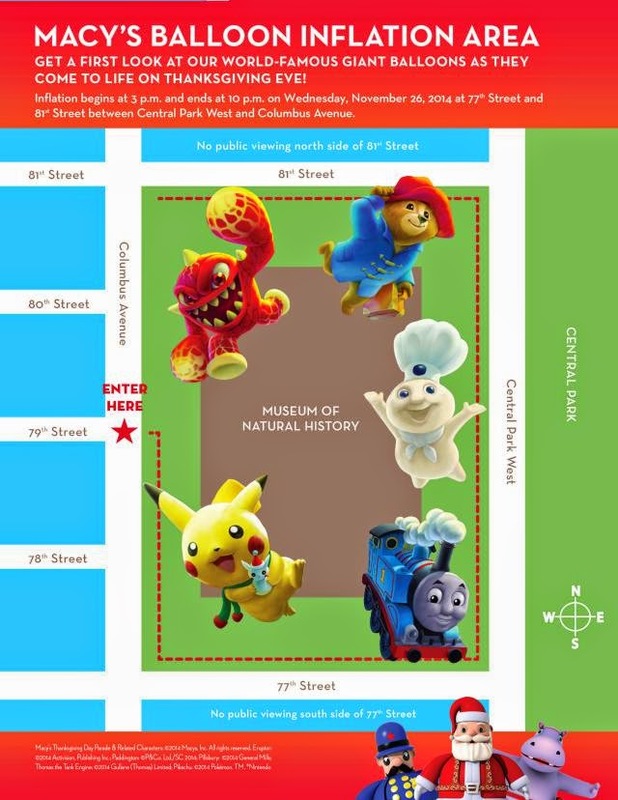 The public entrance to the Macy's Parade Balloon Inflation is located at 79th Street and Columbus Avenue. Subway to the Macy's Parade Balloon Inflation: B or C to 81st Street/Museum of Natural History. If you want to see the Macy's Thanksgiving Parade Balloon Inflation live, our map will help you navigate the crowds that will be vying to get a good view as the balloons grow over the course of the afternoon before Thanksgiving. Live telecast of the Balloon Inflation is also available online for all viewers to see.